Grace Homeschool Classes is a Christian homeschooling group started in 2012 by a team of administrators and teachers with many years of experience working together in the Christian homeschooling community of Temecula and the surrounding area. Grace currently serves more than 350 students and their families with over 80 unique classes for students ages preschool to 12th grade. 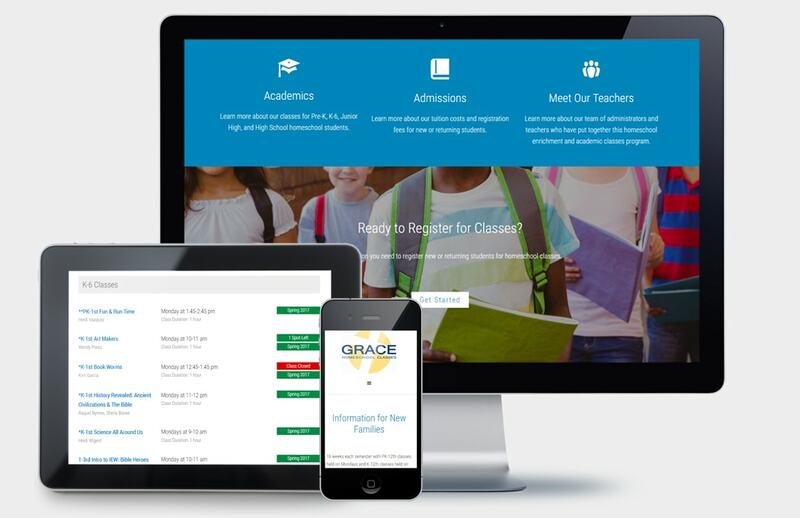 Grace Homeschool Classes had an outdated web design that not only needed a cleaner, more vibrant feel, but did not support the ability for students and families to browse the site on mobile devices. The organization was also in dire need of a more streamlined method of providing class information to parents and students. Additionally, school administrators needed an easier way to maintain and update class and program information for each semester. We delivered an entirely new web design with a fresh and vibrant aesthetic. Based on our research of other educational institution websites and utilizing advanced WordPress programming techniques, we developed an entirely new class catalog system that provides detailed information for classes. Each class in the catalog now displays the class schedule, the teacher, the class description, as well as any required curriculum and fees, all from a single database record. This allows school administrators to easily add new classes and update existing classes, and all their related information, without having to redesign obtuse PDF files or touch any code. The new website is also fully mobile-responsive, allowing Temecula homeschool students and their families to learn about the school's academic offerings from any device. "Although our organization already had a website that was working okay, when Matt at Modmacro showed me just some of how he could improve our site, I was thoroughly amazed. Now that we have the completed project, it is better than expected and I couldn’t be happier. The feedback we have received in the short time the website has been live has been extremely positive. We have heard that it is not only beautiful, but very user-friendly and easy for our families and students to learn about our academic programs and explore classes. We are excited to use this amazing website as a tool to improve how we do business in the Temecula Valley.